In the area of Rémuzat, raise your eyes to heaven…to see our famous birds! Indeed, the massif of the Baronnies shelters the most important colony of griffon vultures of the alpin arc, with about 200 reproductive couples! If you are lucky, you will be able to observe the black vulture, the Egyptian vulture and the bearded vulture…Get your binoculars out! 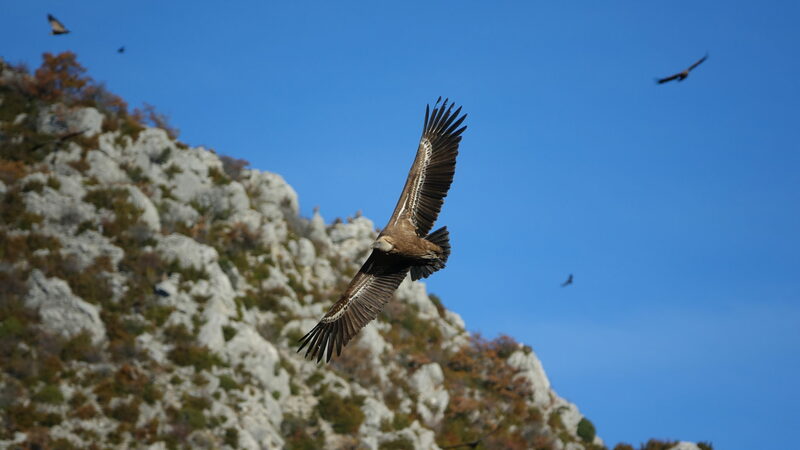 Reintroduced since 1996 in Rémuzat, the vultures colonize all the beautiful cliffs of the Baronnies Provençales. Several hiking trails allowed you to discover the different vultures (Griffon Vulture, Vulture monk, Egyptian Vulture and Bearded Vulture). Their observation is alsopossible from the terrace of the café on the village square or the place de la Roubine where is installed a free observation glasses. It allows to follow the birds in flight and poses in cliff. More informations: la Maison des Vautours de Rémuzat.